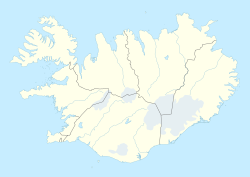 For the village previously (or also) known as Búðir, see Fáskrúðsfjörður. 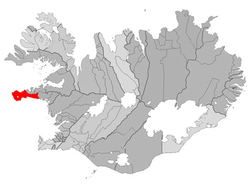 Búðir (transliterated Búdir) is a small hamlet in Búðahraun lava fields in Staðarsveit, which is in the western region of Iceland, on the westernmost tip of the Snaefellsnes peninsula where Hraunhafnará falls to the sea, the original old name of Búðir having been Hraunhöfn. The village belongs to Snæfellsbær, a municipality that has its administrative centre in the town of Ólafsvík. Just a cluster of old buildings, Búðir is the home of popular country inn and restaurant Hotel Búðir and a very old small church. The original old house of the restaurant and Hótel Búðir burned down on 21 February 2001, and had to be rebuilt completely, so as to resemble the original old inn house and to blend into the existing scenery of old buildings and natural surroundings. It is believed that commercial ships and fishing vessels have been making their landing at Búðir all the way back to when Iceland's first inhabitants made their way there across the ocean, and commercial activity started there very early in recorded history. Originally the main function of Búðir was that to act as a commercial and trade hub for Snæfellsnes and the surrounding west coast region, during an extended period of Danish trade monopoly. Today the small hamlet of Búðir along with Hótel Búðir is a center of attraction in Snæfellsnes for tourists and various tourism activities. This page was last edited on 13 January 2018, at 14:06 (UTC).